Lately, I've been feeling old - edging up to thirty, ushering in a new set of fresh starry-eyed post-graduate students, coping with chronic hip pain, oh and you know, celebrating My Munchable Musing's fifth year of existence. It was resurrected from a previous blog in order to fill an intellectual niche during post-graduation underemployment. As you can imagine, a lot has happened and changed in those intervening five years, and the blog has evolved accordingly. I don't think that 23-year-old me, living with the parents, would have seen myself living across the Atlantic, though perhaps would also not have been surprised about the other international wanderings. acted as port of departure in the slave trade. 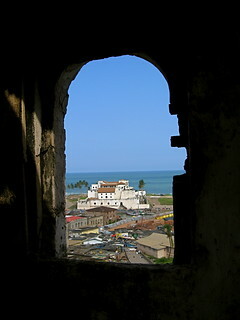 The most recent wandering took me to Ghana for the summer. You may have read the other couple of posts on the topic, but I have not told you about the groundnuts. People in Europe don't do peanut butter ... and they definitely don't harbour this almost irrational desire to eat a peanut butter sandwich when you need a comfort food. But Africa is different. Ok, so maybe they don't consume PB&J in quantity, but the groundnut (AKA peanut) is a common ingredient in soups and stews. Another transplant from the Americas onto the continent, groundnut has become an important source of protein and nutrients across the developing world (where most consumption takes place). What is more fascinting is the connection between current American consumption of all things peanut and our tumultuous historical connection to West Africa. After introduced to the region by the Portugese, peanuts were used to sustain African slaves on the arduous journey to the Americas. It stuck, and is conspicuous in the culinary tradition that developed among Southern African American communities. Over time (and with the help of George Washington Carver in the early 20th century), the little legume made its way into the mainstream of American cuisine and diet. But let's bring it back to Great Britain, which is what I actually did. On my last day in Ghana, I was sent packing with two jars of freshly ground peanut butter. Somehow, my precious cargo made it through the intervening two weeks of intense European travels (complete with buses, trains, and a ferry), to arrive safely in Oxford. The joy of real peanut butter (as opposed to what is passed as such here) was insurmountable, but I felt like some fusion with my surroundings was necessary. And thus, the Groundnut Jammer was born. If you are unfamiliar with Jammy Dodgers (as I was until recently), you probably did not grow up in the UK. This sweet snack is composed of raspberry jam sandwiched between two shortbread biscuits. Simple, yes, but a veritable institution, like Oreos in the US (though the latter predates by about 50 years). With a bit of my Ghanaian peanut butter and some British jam, these turned out quite well, and served as an excellent way to celebrate another blogiversary! 1. Whisk together oil, sugar, and peanut butter (and maybe vanilla) until smooth and uniform. 2. Sift in flour, salt, and baking soda, combining until the dough no longer has dry bits, but is not sticky (may add more flour or a little bit of almond milk to adjust the moisture content). 3. On wax paper or a floured surface, roll the dough to about 1/4 inch thick. Using a cookie cutter or the rim of a glass, cut out circular forms about 3-4 inches in diameter. Using another cutter or the rim of a spice jar, remove 1-inch diameter circles from half of the biscuit forms. Reroll and repeat until all dough is used. 4. Place cookies on a lined baking sheet and cook for 10 minutes (until edges brown) in a 180C/360F oven. Remove and allow to cool completely on a cooling rack. 5. Match up the circles and donuts. Place 2 tsps of jam on the circular biscuit and then cover with the donut. You're done; enjoy!